OK, I’m back on the flight path that I promised. We were beginning to compare the greatest works of Khmer and medieval European Gothic architecture because they emerged at the same time, and thus form a cool cultural comparison. 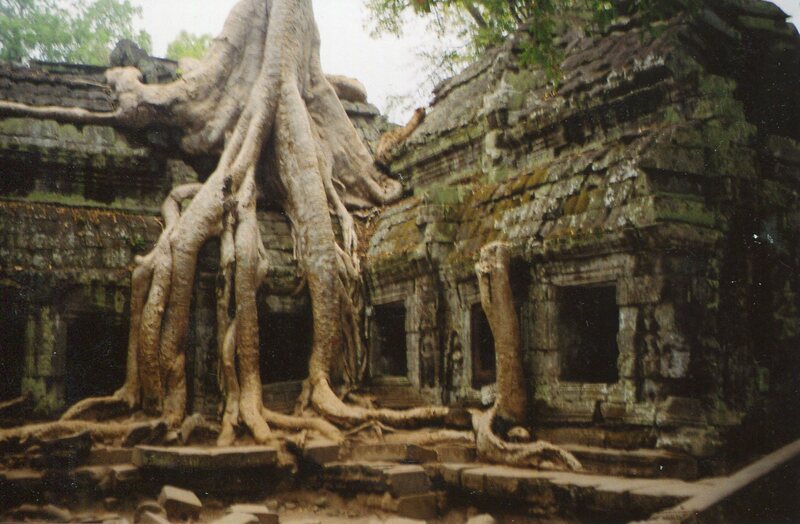 Ta Prohm (pictured above with roots wrapping around it like giant pythons) sure doesn’t look like a Gothic cathedral. Both were built to embody its culture’s view of the universe. We’ll enter the more exotic building in this post. Watch your step. 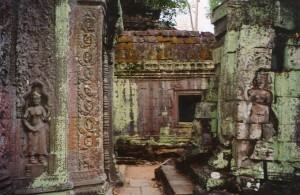 Both Ta Prohm and Preah Khan were built by the Khmer king Jayavarman VII. He began them shortly after he took the crown in 1181. 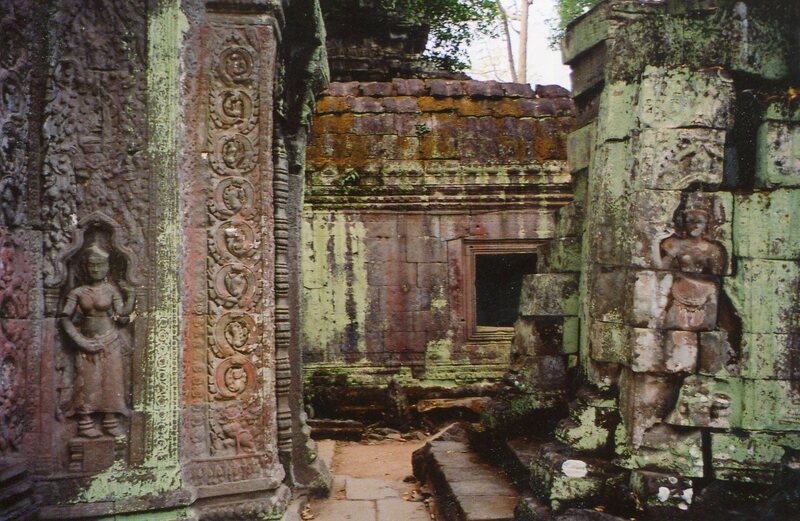 Both are just outside the walls of Angkor Thom, so they were central features of Jayavarman’s steroidal construction program. Steroidal might not be a strong enough word–both were virtually cities by themselves. 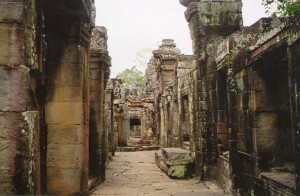 Ta Prohm (above) and Preah Khan probably functioned as both universities and monasteries. Jayavarmen endowed them so much that he must have wanted them to impart his vision of the universe. He was restoring the empire after the succession crises and wars with the powerful Chams in Vietnam. Ta Prohm housed 12,640 people, including 18 high priests, 2,740 officials, 2,232 assistants and 615 female dancers. 79,365 people from 3,140 villages were assigned to provision everyone with food, clothing and mosquito nets. Preah Khan had over 1,000 teachers. But the view of the world that Jayavarman VII invested so much into teaching was very different than what medieval European universities taught. 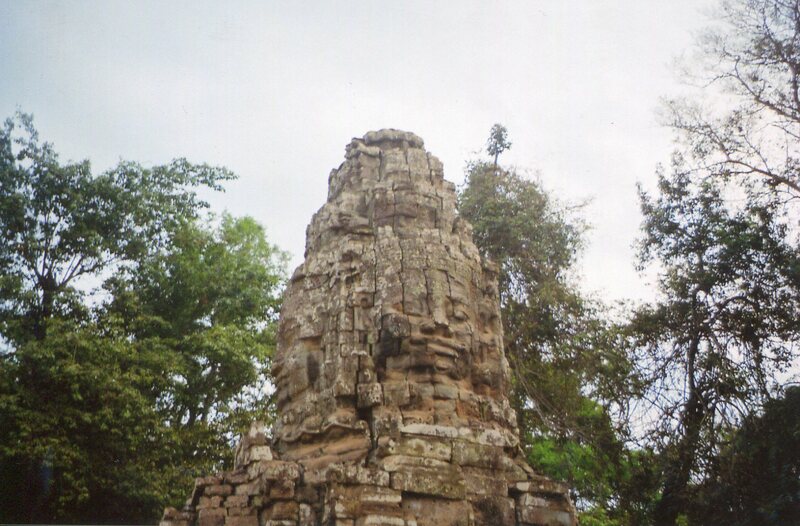 Jayavarman VII had converted to Mahayana Buddhism. But true to Southeast Asia’s tendencies to blend multiple religions. Jayavarman headed a peculiar form of Buddhism, and mixed it with Vishnu and Shiva worship, and with Khmer ancestral cults. Ta Prohm and Preah Khan embodied a very full and syncretic view of the world. 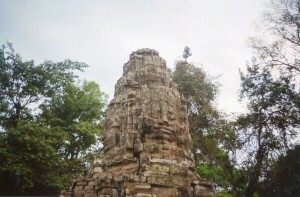 Jayavarman finished Ta Prohm in 1186, and dedicated it to his mother. He conceived her as the Mahayana goddess of wisdom, Prajnaparamita. Jayavarman dedicated Preah Khan to his father in 1191 (only 3 years before the fire that destroyed most of Chartres Cathedral), and he saw him as the deity of compassion, Lokesvara. So Jayavarman blended everything–Buddhism, Hinduism and royal ancestral cults–into a total view of the cosmos, as though he was covering all bases to ensure security. Ta Prohm and Preah Khan lack the immaculate stained glass windows of Gothic cathedrals, as well as their naves with ceilings that rise over 100 feet. But Jayavarman had much more freedom to blend ideas from different faiths–European cathedral builders and university professors had to follow Christian doctrine. And Jayavarman could go horizontal–his temples spread over huge swaths of land to include all the shrines that expressed his complex mixture of ideas. These temples and Gothic cathedrals are magnificent in their own ways. But I had mixed feelings as I made my way through Ta Prohm and Preah Khan. Jayavarman’s view of the world had contrasting personalities, and they reveal Khmer thinking’s richness while the empire was at a high point. More in the next post on Ta Prohm and Preah Khan.